CookieCrazie Classes at CookieCon 2018! CookieCon 2018 registration begins next Wednesday, March 14 @ 7 PM MDT on www.cookiecon.net. I am happy to share with you that there will once again be CookieCrazie classes offered before CookieCon gets underway. This year there are TWENTY instructors doing Add-On Workshops....so there are TONS of hands-on workshops to choose from. You can read about all the add-on workshops HERE. I'll be teaching a total of four classes. Let's explore many creative techniques using corn syrup glaze icing to create rustic autumn decorated cookies together. With such a wide array of possibilities to create texture – from molding cookie dough, layering glaze icing, embossing partially dried glaze, and adding edible clay embellishments, there will be lots of tips and tricks shared to allow each student to come away with many things to incorporate into their own decorating style. Let's explore many creative techniques using corn syrup glaze icing to create Christmas decorated cookies together. With such a wide array of possibilities to create texture – from molding cookie dough, layering glaze icing, embossing partially dried glaze, and adding edible clay embellishments, there will be lots of tips and tricks shared to allow each student to come away with many things to incorporate into their own decorating style. Registration begins on Wednesday, March 14, 2018 7:00 PM MDT. 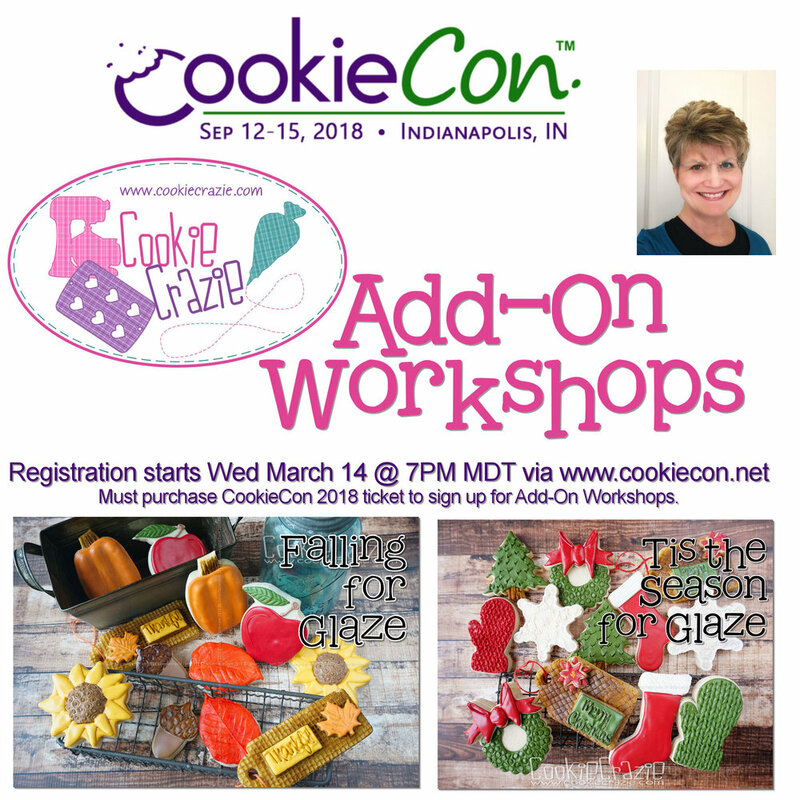 Sign-up for the Add-On Workshops happens at the same time as purchasing a CookieCon 2018 conference ticket. What a joy it will be to see many of you and to decorate cookies together! CookieCon 2015: Greatest Sugar Show on Earth! CookieCrazie is offering classes at 2017 CookieCon! For complete info check out the Classes Page. Get ready for 2017 CookieCon. Tickets for the convention go on sale Wednesday, October 26, 2016 @ 7 PM MDT. It's an event of a life time. Check out this blog post from last year's 2015 event. In addition to the actual convention and sugar show, there will be pre-Cookie Con classes offered Wednesday, March 8 and Thursday, March 9 by a vast array of cookie decorators. CookieCrazie is offering two different classes, one being offered twice. To learn techniques related to the rustic style, check out the "Going Rustic" class offered twice on Wednesday, March 8. And for all things shabby chic, take a look at the "Adding Shabby to the Chic" class offered on Thursday, March 9. 8 AM CST on Friday, October 28, 2016. Tickets will be sold on a "first-come, first-serve" basis with a limit of 12 students per class.